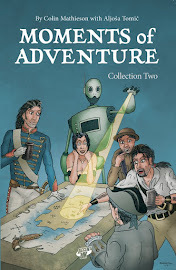 Moments of Adventure: Robots & WesterNoir in Maidstone! Robots & WesterNoir in Maidstone! Coming up this weekend is Accent UK's first convention appearance of 2015 as Dave and Gary return to sunny Maidstone for this Sunday's Demoncon 9! Sadly my passport doesn't cover trips that far South but the chaps had a blast last time and are delighted to be returning, giving them a good chance to chinwag on all things WesterNoir with one or two exciting developments bubbling along. The most imminent is of course Issue 5 which is hoped to be launched at the event, print delivery allowing. This issue, as Dave and Gary teased some time ago, really turns things on their head as we learn more, a lot more about events behind Josiah Black's actions, I'll not say more but look for this cover either at Maidstone or a show near you soon! 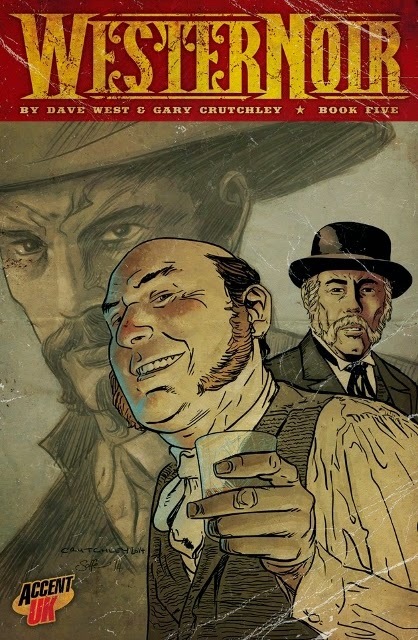 For those who were unable to attend Leeds Thought Bubble Festival last year, Demoncon will also be the next place to pick up WesterNoir's spin off 'Tales Of' series and Stephenson's Robot, both of which were successfully launched in Leeds. And if you need any further incentive, here's a link to a very timely review of Stephenson's Robot from Down The Tubes stalwart, Jeremy Briggs. Don't worry if you can't get to Maidstone as Accent UK's 2015 tour itinerary is starting to take shape and details will be posted here or at Accent UK's own site very soon.